Sunday is this week's kickoff of SuperPhillip Central content, and with it we see a retro review. The announcement of Mario Kart 8 Deluxe to the Nintendo Switch saw the site developing a vested interest in arcade racing games. Last week, we took a look at Pac-Man World Rally, a kart racer. Now, we look at a different kind of racer with this retro review of the Wii version of Need for Speed: Nitro. 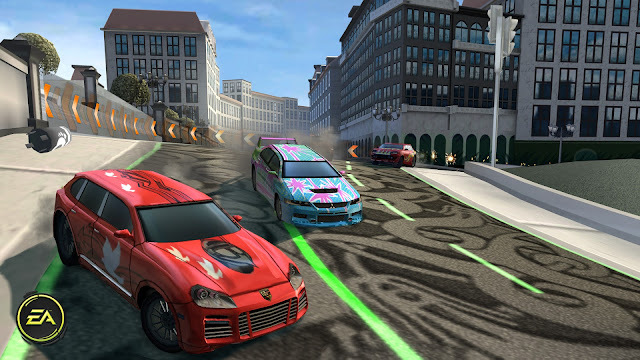 Stylistic street racing meets the Wii with great results. With its lack of power compared to the HD twins, the Xbox 360 and PlayStation 3, third party developers were tasked with creating different versions of their popular franchises for Nintendo's Wii hardware. Some of these experiments turned out horribly, but others turned out quite well. Such was the case with the Need for Speed franchise. Instead of focusing on realism, Need for Speed: Nitro focused on stylistic arcade action, making for a racing game that burned some serious rubber. Career mode offers the most satisfying experience for solo players, delivering three classes of cars, each with their own challenges, around five world cities like Rio, Dubai, and Singapore. 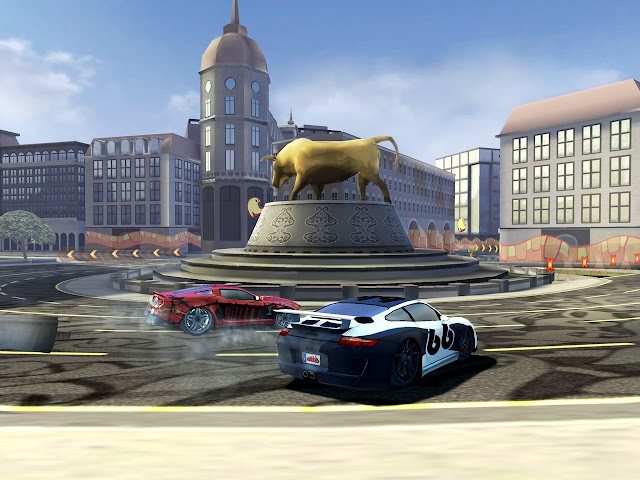 Each city possesses a selection of challenges in them ranging from traditional circuit races against the AI, elimination racers where after every 30 seconds the racer in last gets eliminated until there is one car left, time trials, drift challenges, and special traffic camera challenges where the goal is to drive as fast as possible through speed traps. All races have stars to earn, and these unlock even more Career mode events as well as new customization parts for your rides. The circuit and elimination races have up to five stars to earn (three for placement in races, one for beating a race's best lap time, and one for earning enough style points through drifting, drafting other racers, boosting, and "owning it" or remaining in first place). 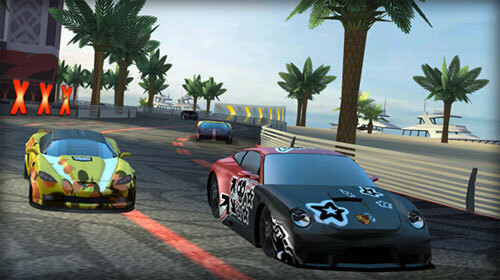 Races in Need for Speed: Nitro are adrenaline-inducing experiences. "Owning It" not only gives you a good amount of style points, but it paints the track and environments in your car's color as well as emblem for an amazing and astoundingly cool effect. It gives incentive to stay in first place as well as allowing you to brag to your friends when competing in multiplayer, which unfortunately never received online play of any kind. Though, a silver lining is that you can play the Career mode with up to three other friends, which makes it a lot more exciting than it already is. The five cities in Need for Speed: Nitro each feature two tracks apiece. These have you drifting through long turns, speeding through the city streets, and many have notable standout moments such as riding along the tops of shipping yard containers for a shortcut, launching from a ramp into a construction site, and passing through parking garages. Each track usually sports up to two shortcuts, and these are marked on the map on the side of the screen, and each lap generally takes about a minute to complete. Despite the decent track variety, you might grow sick of racing on the same ten tracks since the Career mode's plentiful challenges make you race on them ad nauseum. The various locales and tracks to race on are highly varied. 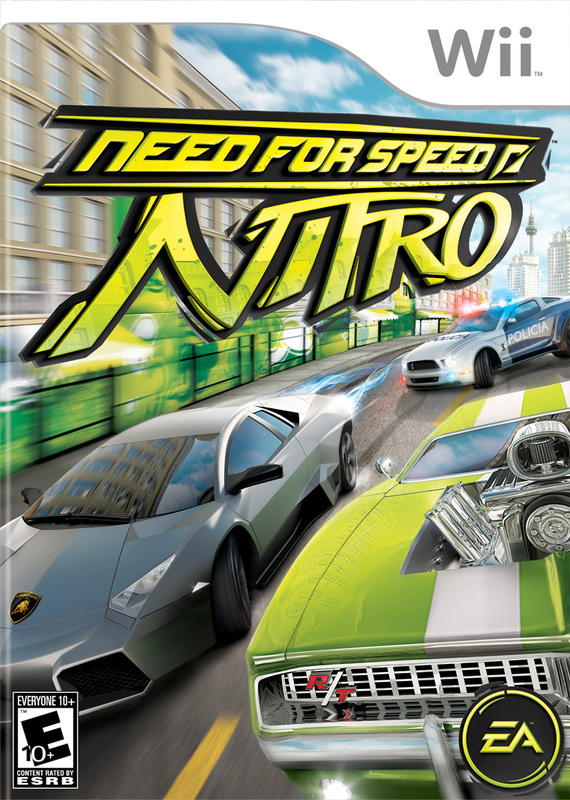 It wouldn't be a Need for Speed game without some police chasing down your naughty street racing self, and the boys in blue are certainly up to the challenge in Need for Speed: Nitro. Many races have police cruisers that chase after racers disobeying the rules of the road. A new twist here is the ability to drive through badge pickups which allow you to stick the cops on an opposing racer, or if you're in first place, it allows you to draw less heat to yourself. With a five star warning on you, cops can become insanely aggressive, running directly into you, plowing you into a wall, and can stall your progress immediately due to their large Hummer-like cruisers. This can be very frustrating during certain races. In addition to badge pickups, there are also wrench ones that automatically repair your vehicle. As your vehicle takes damage from other racers, the police, or through mistakenly running into traffic or crashing into walls, the available space in your nitro boost bar will lessen. At maximum damage, not only will you not be able to pull off a nitro boost, but your car's max speed will be limited, so always being on the look out for repair pickups is paramount to winning later, more difficult races. There's no such thing as sunshine slowdown in this rush hour. Need for Speed: Nitro sports an impressive array of customizable vehicles, over 30 licensed vehicles in all, from Ford to Chevy. The amount of customization is appreciated, allowing you to alter the color of your car through one of dozens of different color combinations as well as spraying the car with various pre-made emblems or your own custom one. It adds a degree of creativity and a personal touch to your vehicle, which is really cool. Each vehicle has its own set of stats in categories like speed, acceleration, drifting, handling, and defense, and in Career mode, you earn money to buy new vehicles to add to your garage. Nitro also sports a wide amount of available control options, such as the Wii Remote and Nunchuk, the Wii Wheel or Wii Remote by itself for motion-controlled driving (fun for easier races, but not as precise as necessary for harder ones), and the GameCube controller. Perhaps the most novel one is the ability to play with the Wii Remote in one hand, twisting the remote to make turns. Of course, all the control options in the world don't matter if Need for Speed: Nitro's cars all handled poorly. Thankfully, this is far from the case. Nitro's cars feel sensational to control, offering precise turning, cornering, and handling. Drifting is next to effortless, just require the player to hold down a button while turning the car. The only real problem with drifting is that the button to do so is the same as braking. If you're going below a certain speed, your car will brake instead of entering into a drift, which can quite the frustration in a heated race. Drifting feels smooth, though if you're not driving fast enough, you can enter into a brake instead. As stated, the Wii is obviously much weaker hardware when compared to both its competitors at the time, the Xbox 360 and PlayStation 3. Because of this, instead of going for a realistic approach to the visuals, EA went for a stylized one. 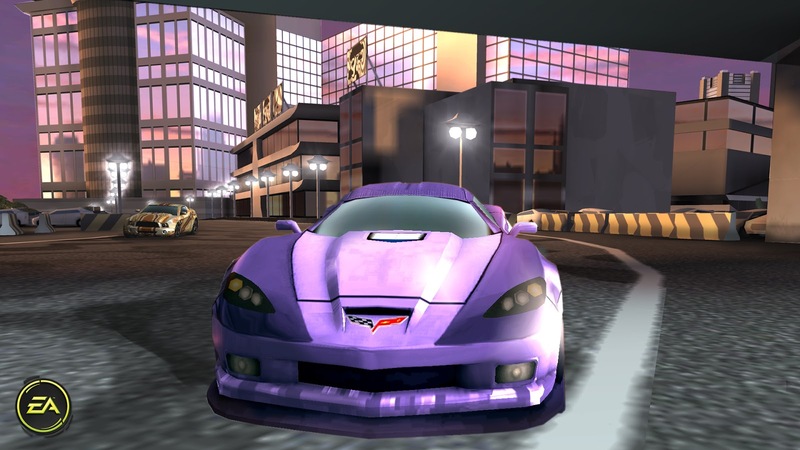 Cars and characters have a fantastical degree to them, sporting a cartoon-like art style that isn't nearly as serious as the HD twins' version of Need for Speed. This is actually pretty pleasant to the eye, mixing realism and highly stylized art to tremendous effect. The game also runs at a steady clip, so feel free to feel your need for speed to the fullest. On the sound side, you get a funky and rock-filled soundtrack of licensed music. There are about ten songs total, and they cycle through enough so you don't get bored of them too quickly. Feeling the need for speed along the Dubai coast. 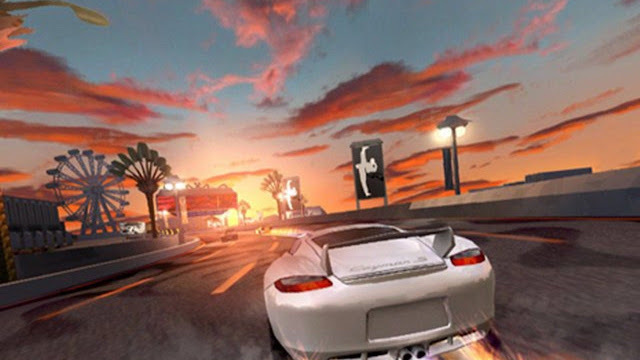 Need for Speed: Nitro is an underrated arcade racer to add to the lineup of wonderful Wii games. It might not have had the online of Mario Kart Wii or ExciteBots: Trick Racing, but it does still have superb arcade handling and gameplay, stellar stylized visuals, and enough content to keep those with a need for speed coming back for more.